Rock Band led from gate-to-wire to win the Minister’s Cup at Seoul Racecourse this afternoon, holding off Triple Nine who had to settle for 2nd in his second consecutive Classic race. The Rock Band/Triple Nine 1-2 was a remarkable achieivement for Isildore Farm, who bred the pair of them and also – although we have come to expect it by now – for trainer Kim Young Kwan. Rock Band was sent off as the 4th fvourite in the betting in a field that was depleted in terms of numbers by the scratchings of Daegunhwang and Bulpae Line. Last time he faced such a small field, Rock Band got stuck in traffic and suffered his only loss to date. This time, jockey Kim Yong Geun decided to take the race by the scruff of the neck and lead from the gate. Derby winner Yeongcheon Ace was slow to settle in the early stages but went with the leader as did Triple Nine, who began the race as favorite, and KRA Cup Mile winner Rafale. It was a lead Rock Band would never relinquish. Triple Nine lost some ground beginning the long turn for home and that would prove crucial as Rock Band had enough in hand to hold off his late charge and take victory by half a length on the line. Yeongcheon Ace battled on for 3rd while Doraon Hyeonpyo, last year’s champion juvenile, got up for 4th ahead of a tiring Rafale. 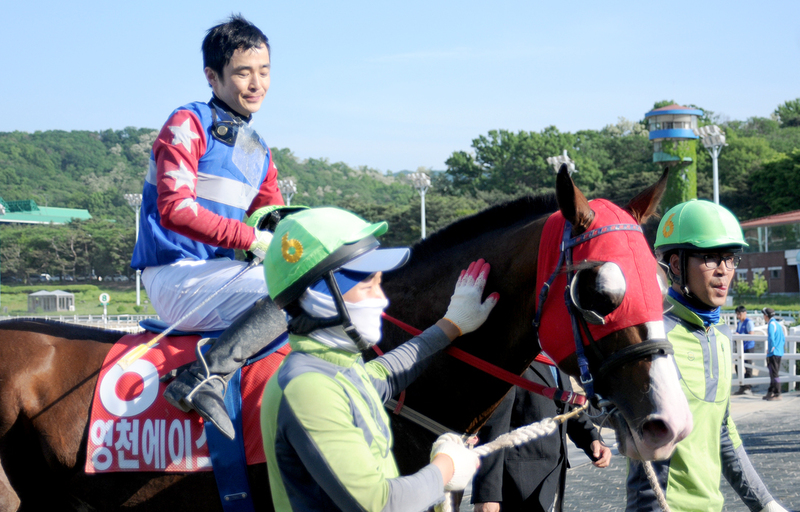 For jockey Kim Yong Geun, it was a 2nd Classic of the year after winning the Korean Oaks on Jangpung Parang, also for trainer Kim Young Kwan, at Busan last month. Rock Band is the full-brother to Indie Band, another product of Isildore. Indie Band won the 2013 President’s Cup and Grand Prix Stakes but has been sidelined for the past year. The younger brother never raced as a 2-year-old and today was only his 6th career start. There could be much more to come from him. Next week, Busan takes its summer vacation but there will be plenty of action at Seoul. Trainer Kim Young Kwan will be in Singapore to saddle Gamdonguibada and Nobody Catch Me in the KRA Trophy at Kranji. He’ll not be training a 1-2 finish there. Today though, Rock Band was throroughly on song. Rafale struck first in the KRA Cup Mile. 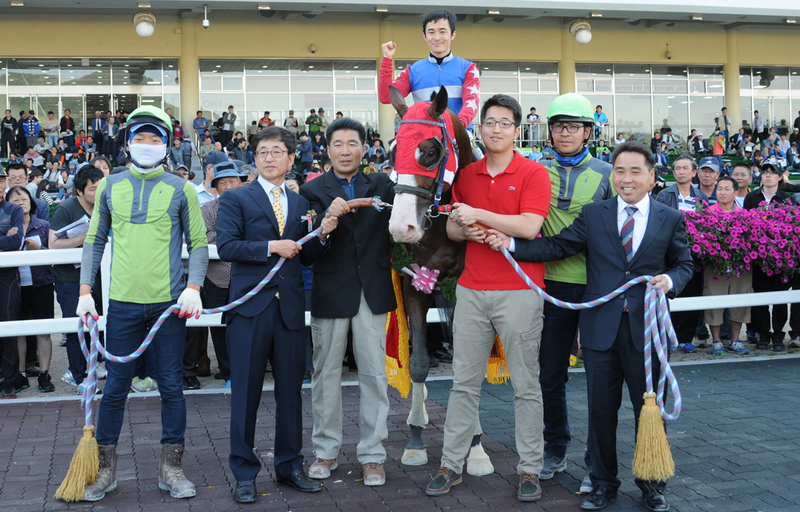 Yeongcheon Ace romped home in the Derby. They both line up, alongside just five others, for the final leg of the 2015 Korean Triple Crown – the Minister’s Cup – at Seoul Racecourse on Sunday afternoon. He will be either favourite or second-favourite. He didnt make it to the Cup Mile but finished 2nd in the Derby and won a quick race over 1800M last month to keep him ticking over. Didn’t finish that strongly in the Derby which may be a concern but trainer Kim Young Kwan will surely have him spot-on here. He probably wont lead but he should be handy. Credit to connections for entering their horse in all three legs of the Triple Crown but Yuseong Fighting is a sprinter. He will go out quick but he won’t get the trip with 1400M so far being his limit against decent opposition. Expect to see him win plenty of races over six furlongs but don’t expect him to win this. The wildcard. Unraced as a 2-year-old, he sauntered to victory without really being tested in his first four starts this year. He then had a chance to show what he was made of over 1800M last month but in a small field he got a dreadful trip, managing to get stuck behind slow-moving horses twice. Rock Band flew home but it was too late. Kim Young Kwan could have entered others and Kim Yong Geun gives up a weekend of rides at Busan to partner him. He can’t be ruled out. Second in the Cup Mile and fifth in the Derby, this is another for who the distance may be an issue. Doraon Hyeonpyo was last year’s Champion Juvenile but the Derby was his first attempt at a mile and while he should beat plenty there are a few who may be too quick at the business end of the race. 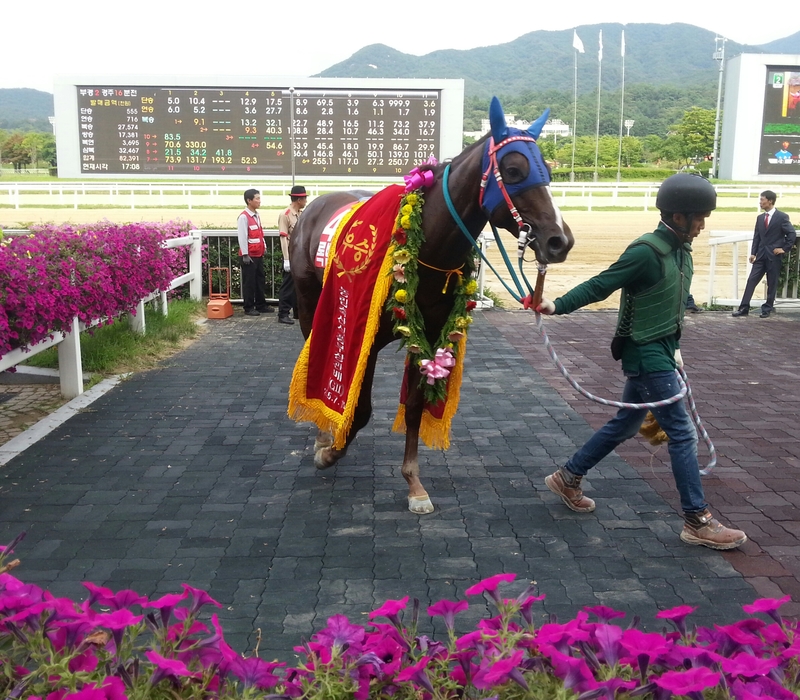 The KRA Cup Mile winner and then 3rd in the Derby, less than three lengths behind Yeongcheon Ace. He is quick and the distance shouldn’t pose too much of a problem for him. Expect him to settle in the middle of the pack and improve around the home turn. Rafale is most likely to start 3rd favourite and he should be looking for at least a place. A very creditable 6th in the Korean Derby but there is no strong reason to believe he can finihs much higher here. Seongbong has raced once since the Derby, dropping all the way down to five furlongs and coming 2nd. 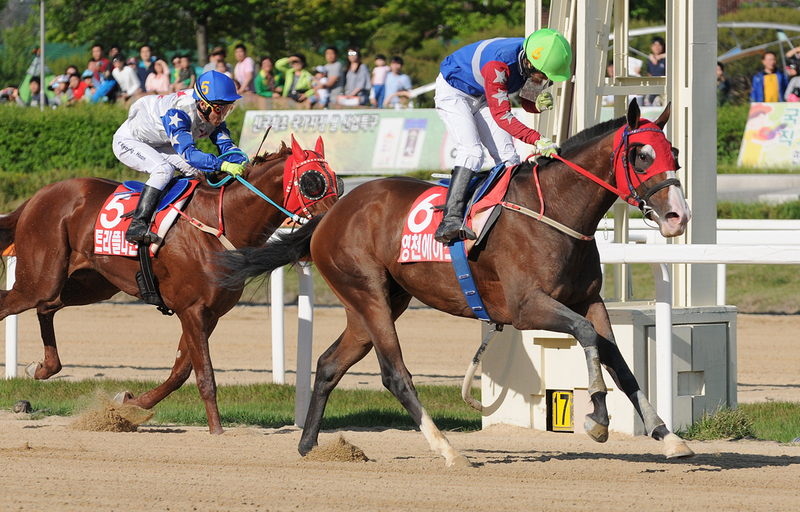 Following Daegunhwang’s scratching, he is the home-track’s sole representative. This is a small field so anything can happen but he is up against it here. The Korean Derby winner and the likely favourite here. He is a closer and sat right in the middle of the pack in the Derby. Given the small field today, he may even go right to the back early on. Others have show more speed but he will get the distance and has every chance of grinding out another win. 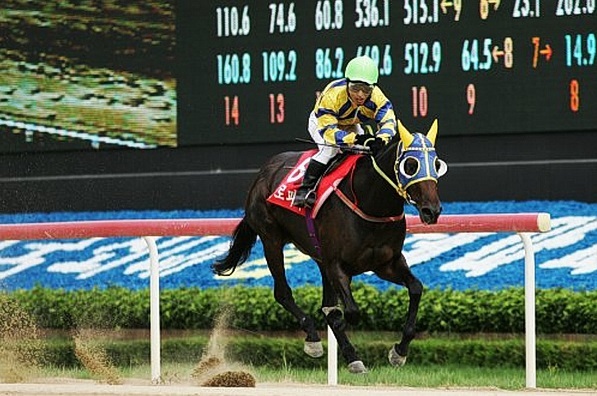 Choi Si Dae is the current big race jockey. We’re just over a week away from the Korean Oaks and thirteen are currently set to line up for the fillies’ Classic at Busan Racecourse on Sunday June 21. For the first time since 2012, there isn’t a Derby winner among them. Speedy First and Queen’s Blade completed the Derby/Oaks double in 2013 and 2014 respectively but this year, only two fillies took their chance in the Derby and of those only Smart Time, who was 7th, is also entered here. 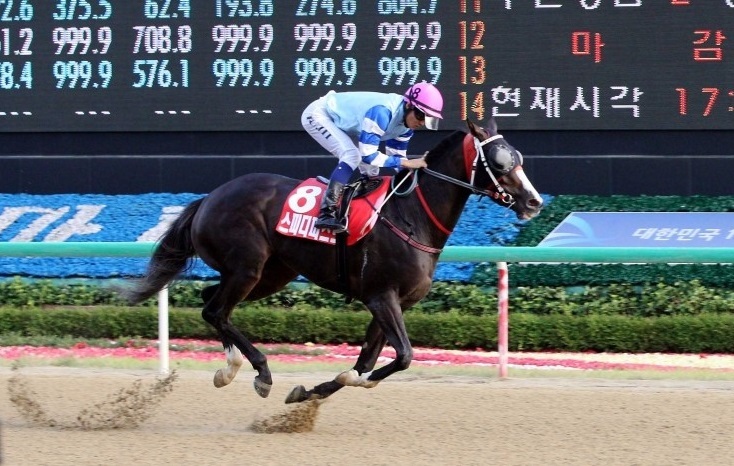 Meni Money heads a five-strong challenge from Seoul. She won an early Oaks trial in the capital in March and is on a five-race unbeaten streak. The last filly from Seoul to win the Oaks was Eurofighter in 2010.